Often overlooked and skipped on Peruvian tours, Arequipa is a treat to those who visit. Ordinarily white, at sunset the buildings in the main square turn a vibrant golden. Step inside the Santa Catalina de Siena Monastery and you enter another world. The monastery has stood the test of time since 1579. It’s survived countless earthquakes and still operates as a cloistered convent for the Dominican Second Order. Encompassing 20,000 square meters, it takes a while to walk the corridors and peak inside the rooms where nuns used to work and sleep. At its peak the monastery housed up to 450 people. Today fewer than 20 nuns stay in an area that is closed to the public. In early times it served as a place where the wealthy could protect their second born daughters. To enter the convent a dowry of as much as 2,400 silver coins was required which is about $150,000 today. At one time it was a wealthy convent until the money was sent to Rome. Now they are poor. 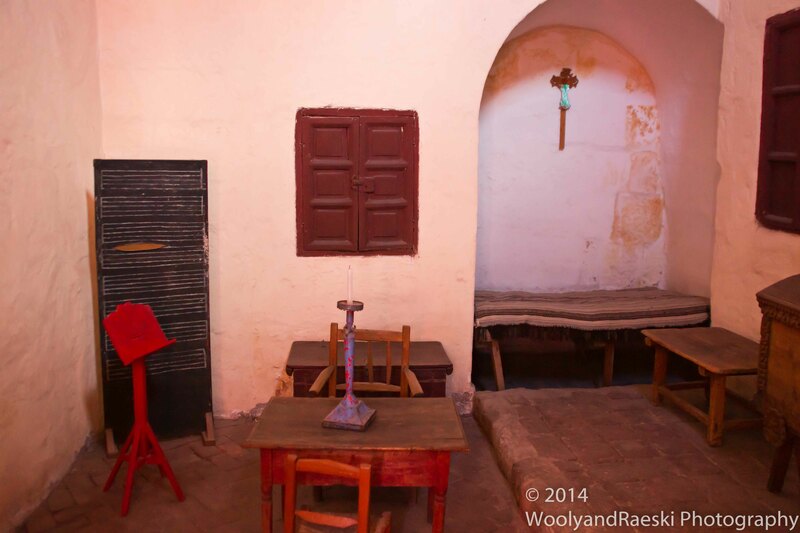 The architecture is a blend of colonial and native styles – painted with bright and vibrant terracotta colors which happen to rub off on your clothes as Wooly discovered. Every corner you turn and every doorway you step through is a treat. One of the many courtyards. Every doorway holds a surprise on the other side. After a major earthquake in 1592, the nuns built individual bedrooms since the dorm they stayed in was destroyed. They built an arched sleeping area in each room. The stronger arches provided early earthquake protection for the nuns. Early earthquake safety – Sleep under an arch. Gardens inside the walled monastery are as peaceful as they are beautiful. If you want to sit and contemplate you are welcome to do so after the tour when you are free to walk around on your own. You can even sip coffee in a small courtyard featuring a snack bar. And finally, when you come across a long and steep set of stairs – climb them. The view at the top is worth it. Just be careful because those steps aren’t uniform in size or height. I wish this was my backyard. A great courtyard for a cup of coffee. Climbing the stairs was worth it. What a view!